Dienekes’ Anthropology Blog: Bottleneck in human Y-chromosomes in the last 10,000 years. "the fact that two separate Eurasian-specific lineages (CT and D) coalesce to ~70kya destroys the theory that the spread of modern humans into Eurasia happened together with UP-related technologies, a theory that was already on its last legs given the evidence that pre-UP admixture with Neandertals had taken place"
I think anyone who believes otherwise at present is way behind the times. I notice the split between C3 and the other C's (now notated as a C1/C2) splits fits exactly the time C1 reached Australia. Unfortunately the diagram doesn't include the SE Asian K haplogroups but from the NO PR data it looks as though the K split slightly postdates the C1/C2 split. 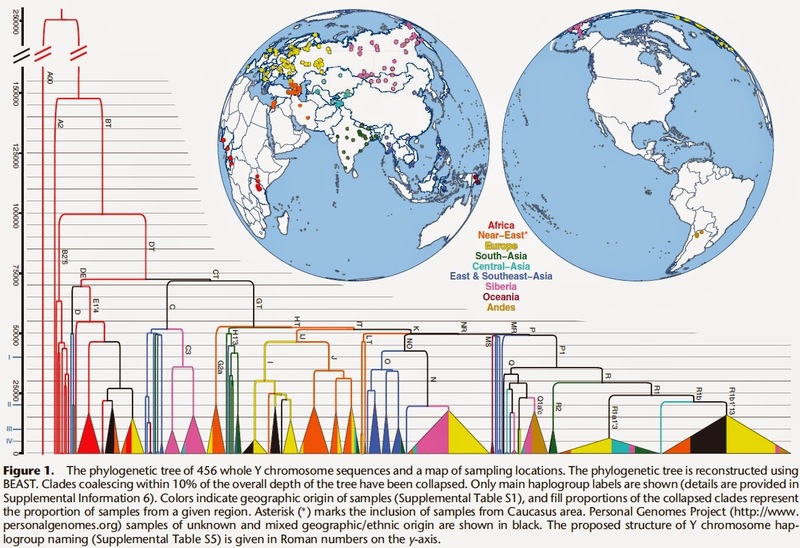 "These lineages are all found in Eurasia, but only E1'4 is found in Africa. I think this points clearly to back-migration of Eurasians into Africa"
Seems pretty convincing to me. "but also infer a second bottleneck that occurred in the last 10 thousand years". It is perhaps significant that the deepest Y-DNA bottlenecks occur where the development of the Neolithic was most developed. "In contrast to demographic reconstructions based on mtDNA, we infer a second strong bottleneck in Y-chromosome lineages dating to the last 10 ky. We hypothesize that this bottleneck is caused by cultural changes affecting variance of reproductive success among males." This hypothesis does not seem unreasonable, however given that one can clearly see a global bottleneck at that time, there has to have been some cause for the cultural effect of the Y pruning you are noting. A fuller hypothesis might include some global catastrophe happening, i.e., the beginning of the Tardiglacial Period, that perhaps lent itself to the formation of strong tribes under leading men. Because it's not like they had the Internet to transmit cultural data that quickly! Cheers. It looks like the shared ancestor of D and E1'4, at ~70 kya, significantly predates the coalescence of the major Eurasian branches ~50 kya. The latter is clearly associated with the rapid dispersal of AMH in Eurasia around 50,000 years ago. Even the split of E-M96 into E1 and E2, around 55 kya, slightly predates the major Eurasian expansion, unlike its sister D, which forms ~50 kya like the major Eurasian branches. So I don't think it's clear at all that DE or E (let's not forget that DE is also found in Africa) originated outside of Africa, and even if they did, those Eurasians were most likely still confined to West Asia. The only reasonable method, and good to see. However, it could still be that dates earlier than ~30kya are successively underestimated. A good test would be to create age estimates based on fairly recent samples, and see how they stack up to actual, older ancient DNA dates, and then do the same test again and again for yet older samples. I bet you would see a systematic trend that with more recent dates used for calibration, older splits are always underestimated. From that, one could extrapolate a gauge curve for split dates older than any available sample. Also, R is clearly Gravettian (as I have often stated), and the split of R could be a bit earlier (~35kya). Remember that any ancient DNA sample found only gives a lower limit on the haplogroup date - not the actual date. It is again interesting to see that R1b spread widely just after LGM, while R1a is more of a bronze age phenomenon. Also, unless these age calculations change drastically, this again puts IJ -> I as the European UP, G2a perhaps as the ~Anatolian UP, and IJ -> J as perhaps the Levantine one, with likely post-LGM E admixture in the very south. Still strange that there is no stronger Gravettian signature (which was a pan-European / NW Asian movement) than those feeble QR and R splits. Contrary to an ad hoc, out-of-Africa interpretation by the authors, the new phylogeny fits nicely with an out-of-America scenario. 1. The oldest clades found in Africa are too divergent and African specific. This is a legacy of archaic hominins in Africa in the modern African paternal gene pool. They are attested in the NEw World since 1492 but are not found outside of Africa anywhere along the proposed migration routes out of Africa 100,000 or 70,000 years ago. 2. Modern humans colonized Africa around 70-50,000 years and hgs E1-4 in Africa are a signature of that migration. 3. An upstream hg C3 found in the Americas is opposed to the Old World hg C1-7. The presence of C3 in Siberia from Koryaks to Buryats is an indicator of a back migration out of the Americas some 10,000 YBP. If the migration went the other way, we would have seen other, more common and diversified Asian lineages in the Americas. But we don't. The restricted distribution of C3 in Siberia supports the idea that it entered the Old World recently, most likely from the New World, where it's found in both North and South America. 4. As Fig. S9 shows, Amerindian populations have very upstream and very downstream lineages but nothing in between. This suggests extreme isolation of Amerindian populations and their descent from the original DT (or CT) population of which African E is a subset. hi there. i just want to make a a brief comment. please do not take what i am about to say as an insult or a personal attack. it is meant as neither. the argument that because there was a clear divergence in ydna ~250,000 ya, does not indicate why or where the oldest ydna originated. all it indicates is that a split occurred and that the african line changed very little over 250,000 years. The current location of A yDNA is neither necessary, nor sufficient to imply that it is where it originated. All other yDNAs popped up from an older one, not new men suddenly a from somewhere other than earth. All that the current yDNA phylogenies indicate is the current relatedness and recency of emergence of current yDNA families. All that the link between A yDNA and modern presence in soley in Africa is to for reaskns unknown, Africa's yDNA has been stagnate. A more parsimonious conclusion is that Africans are descended from a very small founding male population and/oor had very restrictive mating rights. Mdern purebred dogs and race horses show us very clearly how maternal and paternal lineages become stagnate and why. it is an embarrassment to me, with my background in both anthropology and the philosphy of science, that anthropolgist have been demanding that an illogical and unsuppirted theory is unassailable dogma (try to proceed as a grad student in the US if you question it. You are treated almost as poorly as the aquatic apers and often occused of racism). These dates agree very well with the ones we get using Ust'-Ishim man to calibrate (these authors used Anzick-1 and Saqqaq). The mutation rate they came up with was 0.74 x 10E-9 mutations/bp/yr, while Ust'-Ishim man gave 0.76. A is not actually a single lineage, it is paraphyletic. Everything not A (i.e. BCDEF) is actually the A1b2 branch, so when we say A we actually mean several of the most basal branches - A00, A0, A1a, and A1b1. And B is also primarily African, so non-African Y-DNA is really just A1b2a. This is precisely the opposite of what you would expect if *Africans* descended from a small founding population. Thanks to Dienekes for permitting that everyone speaks here, Russians above all: one is certain, the other is hypothetical. I would say something about all the Jewish haplotypes used from previous paper that I (as I say) already broke in pieces. It is agood thing that of these sample we have now the STRs and that a Jewish R-L277 has for the first time I know DYS392=13 and not 14. Not in Europe. In Europe, R1b is no older than 5000 years old. "Not in Europe. In Europe, R1b is no older than 5000 years old." Or the lucky clades of R1b that were lactose tolerant are no older than 5000 years old? The Neolithic bottleneck might be caused by battles among ancient tribes, and the subsequent lineage expansions are surely the results of agriculture. ergo, Africa is birthplace of all men"
If this were the bulk of the argument you might have a point, but it's not and you don't. The bulk of the issue is not that the only modern A yDNA is in Africa, but rather that all ancient DNA is A and from Africa. When you are able to show older samples from, let's say, America, then come back and we can chat some more. And I don't think anyone would take offense at your presentation, only your misuse of logic. 1. The oldest clades found in Africa are very old indeed. However, the split of haplogroup B from CDEF is only ~30 thousand years older than the breakup of CDEF. 2. Modern humans then colonized Africa 70-50 thousand years ago. Well, I guess 30 thousand years is plenty of time to go to America and back. 3. American C2-M217 (old C3) is mostly C2b1a1-P39. There is also some C2(xC2a-M93, C2b1a1-P39, C2b1b-M48, C2c-P53.1, C2d-P62, C2e1a1a1-M407) in South America. In Asia there is C2a, C2b, C2c, C3d, C2e, and C2*, with the greatest diversity perhaps around Mongolia, though C2 is found from Eastern Europe to ISEA. C2 in general coalesces about 35 thousand years ago. Therefore it of course follows that Siberian C2 is a recent back-migration from Americas 10 000 years ago. Okay. 4. Looking at figure S9, Americans have limited subsets of clades that originated around 35 thousand years ago and are also found in Eurasia. "Very upstream and very downstream" they are not. "it is an embarrassment to me, with my background... that an illogical and unsuppirted theory is unassailable dogma"
Although it is off topic, I find this kind of response fascinating. Obviously this person hasn't looked into the topic for even 20 minutes, yet wrote a "brief" response for longer than that. As capra has clearly-ish stated, the 'A' branches of the Y-haplogroup tree are each entirely separate thin branches of their own; each growing from the trunk. All of the rest are twigs on one single thick branch. That's why they use a tree as a metaphor. It is supposed to be clear, but I think most people do not even understand how trees grow! Plant a seed and watch. You will learn a lot. Yet again another disappointing report on haplogroups. My haplogroup J1 was treated rather like a dog's dinner. The phylogenetic tree, is to use a word, crap. Men whose haplogroup is J1 have paid a lot of money to test their Y chromosome for relevant SNPs to J1. I have done the WTY, the BigY and FullGenomes at considerable cost to me and WTY test found a new SNP L829 in my result. The test cost $750, I got a substantial discount but it still was a lot of money. So I was somewhat miffed when the report listed my subclade SNP as coming from a Druze. It is obvious the researchers took a lot of shortcuts and did basic research. My subclade is found in the UK, Ireland, the north Mediterranean Europe, in Anatolia and rarely in the Levant. Given the Druze appellation distorts the fact that the discovery of that SNP was in a man who was not a Druze or from the Middle East. The report also says to all those people who paid big bucks for research into their haplogroup that their work and money is not important. Just compare the researchers efforts with that done by the people who administer the J1 project at FTDNA. The former is crap, the latter years ahead. "All that the link between A yDNA and modern presence in soley in Africa is to for reaskns unknown, Africa's yDNA has been stagnate. A more parsimonious conclusion is that Africans are descended from a very small founding male population and/oor had very restrictive mating rights." Your statement and conclusion are incorrect. African A-yDNA is quite diverse. Don't let the haplogroup naming scheme fool you - it is Eurocentric for reasons of early testing funds. You might as well assign the letters A through X to the most prominent A subgroups, Y to B, and Z to DT. Another extreme? Sure, but if Africans had dominated early y-DNA research, this might have happened. Did you know that the Ukraine, the southern part of Russia down to the Caucasus, arguably including parts of Azerbaijan and Armenia, and western Kazakhstan belong to Europe? Even if clades did have a measurable coalescence time it really has no bearing on anything as far as migrations go. We know now that races and clades did not form due to some kind of founder effect, this has been completely falsified many times now. Drives me crazy how contradictory people are. Race is not related to clades one minute, yet is being used to try and track presumed migrations two seconds later. What are you talking about? There is r1b found in spain 7500 years ago now, and even years ago it was found in bell beaker already. This is just like how blue eyes are supposed to not exist until 5k years ago and only just came to europe, then we find them in ancient DNA...just some made up crap by people with a pathetic agenda. One possible catastrophe that could have caused a bottleneck was the 8.2 Kiloyear Event, which was caused by sudden release of impounded cold glacial water into the Atlantic. The resulting rapid cooling combined with rising sea levels and shifts in precipitation played environmental havoc. "when we say A we actually mean several of the most basal branches - A00, A0, A1a, and A1b1". And checking the pattern of their distribution and formation is just as fascinating as examining the non-African lineages. As Eurologist said, 'Don't let the haplogroup naming scheme fool you - it is Eurocentric for reasons of early testing funds'. "This is precisely the opposite of what you would expect if *Africans* descended from a small founding population". Yes. I would have though the idea that new species arise from the expansion of a single small population would be well and truly dead by now. "1. The oldest clades found in Africa are very old indeed. However, the split of haplogroup B from CDEF is only ~30 thousand years older than the breakup of CDEF." Here and below I take the dates with a degree of caution. Geneticists' dates is like weather in my home country: it changes throughout the year very dramatically. You get a bottleneck 100,000 years ago and the B clade starts looking "younger." It's phylogeography and tree topology that matter: Both A and B are African-specific. If there was a migration out of Africa, they would have been strewn at low frequencies and in ancient remains around the globe. Just like they are in the New World after 1492, the consequence of slave migration, the only attested migration out of Africa. "2. Modern humans then colonized Africa 70-50 thousand years ago. Well, I guess 30 thousand years is plenty of time to go to America and back." "3. American C2-M217 (old C3) is mostly C2b1a1-P39. There is also some C2(xC2a-M93, C2b1a1-P39, C2b1b-M48, C2c-P53.1, C2d-P62, C2e1a1a1-M407) in South America. In Asia there is C2a, C2b, C2c, C3d, C2e, and C2*, with the greatest diversity perhaps around Mongolia, though C2 is found from Eastern Europe to ISEA." It's this proliferation of lineages outside of America that's suspicious. And only 1-2 of them presumably got to America. And only 1-2 out of the Q clade. And no other lineages from any other clade at all. It's either selective pressure in Asia that drove this diversification or lineage extinction in America that reduced Amerindian diversity. "Therefore it of course follows that Siberian C2 is a recent back-migration from Americas 10 000 years ago. Okay." If you don't read the tree as if it was a passage from Genesis, but actually put it in the context of other facts and use logic, then, yes, it's a hypothesis to seriously consider. That's when the Beringian ice melted, that's when we first begin seeing new Mongoloid phenotype in East Asia with decreasing intensity from north to south in modern Asian populations, that's why Amerindians and East Asians draw close in some PCAs, etc. C2 is East Asian specific, hence likely recent. It's pan-American, hence likely older than it is in Asia. NO is not found in the Americas, hence it's unlikely that 12,000 years ago there was a migration to the Americas. "4. Looking at figure S9, Americans have limited subsets of clades that originated around 35 thousand years ago and are also found in Eurasia. "Very upstream and very downstream" they are not." The whole midstream of the phylogeny - DE, HT, IT, K, NO and M - is not found in the Americas but C and P somehow got there. Once we toss A and B out as possibly African hominin legacy, yes, Amerindian lineage collection is made of very upstream and very downstream clades. DE is Afroasian but not found in the Americas, so it's likely of post-New World times. C is most upstream but it's in the Americas, although America is presumably a recently colonized continent, and P is presumably most downstream but it has the widest distribution of all clades, hence likely old on distributional grounds. Bottomline, you can't just rely on the logic "area with greatest diversity means area of origin". Human evolution is a complex process with lineage extinction, selective pressures, bottlenecks, archaic admixture, etc. going on, hence a haplogroup's geographic range is relevant to its phylogenetic position and the frequency of one lineage is often a better predictor of area of origin than lineage diversity. @ German Dziebel: You seem to require attestations to recognize migrations out of Africa yet you produce none for your ridiculous "out of America" migration theory. Yeah, the dates are just estimates subject to multiple sources of uncertainty. And yes, the centre of diversity is not necessarily the area of origin. But you have presented absolutely nothing to make us think the New World is the area of origin. A and B *are* present in Eurasia at low levels, though they are usually attributed to Holocene immigration from Africa. There is an English clade of A, for instance. If the original Out-of-Africa source population was relatively small, then we expect it to coalesce to a single Y haplogroup at some not too great time depth as a natural consequence of drift. In the Middle Paleolithic conditions were harsh and populations small, so this just doesn't seem surprising. Australia parallels America, where we find K2b1 and C1c, rather than Q and C2. DE is not the "midstream" of the phylogeny. Of course "upstream" and "downstream" are relative terms, but CF is a node under CDEF, so DE is necessarily upstream of both P and C. P is no more downstream than any other clade, except relative to its parents of course. This all seems irrelevant to your model, which only requires some mechanism to erase almost all of the Y chromosomal diversity of the New World (and rather well sorted migration streams into the Old World). The proliferation of lineages outside America is suspiciously easy to explain by the mainstream view, to be sure. C2 is pan-American in the New World yet East Asian-specific in the Old World? I doubt you can defend that claim. The absence of NO proves nothing. O is virtually absent in far NE Asia even today, and while N is common in Siberia at present is only about 20 000 years old. What magic force was impelling it to head straight for Beringia and impose itself on the existing population? @capra:If the original Out-of-Africa source population was relatively small, then we expect it to coalesce to a single Y haplogroup at some not too great time depth as a natural consequence of drift. I agree - a small founding population of related family groups wouldn't be expected to represent all their wider population's lineages, just a subset. "Both A and B are African-specific. If there was a migration out of Africa, they would have been strewn at low frequencies and in ancient remains around the globe". So you believe that God (or some similar entity) stood by the exit route from African haplotypes emerged. That is so unlikely to actually have been the case I'm surprised that even you think it possible. "Just like they are in the New World after 1492, the consequence of slave migration, the only attested migration out of Africa". So you believe that God (or some similar entity) stood by the same exit route from Africa to make sure that there would again be a totally representative sample of African haplotypes leaving fro the New World. I'm stunned at your naivety. "It's this proliferation of lineages outside of America that's suspicious. And only 1-2 of them presumably got to America. And only 1-2 out of the Q clade". So yet once more you believe that God (or some similar entity) should have stood by the entry route and made sure a totally representative sample of Eurasian haplotypes would enter America. The fact this didn't happen is the sole basis for your belief in Out of America. "The whole midstream of the phylogeny - DE, HT, IT, K, NO and M - is not found in the Americas but C and P somehow got there". I would have though the explanation for that was obvious, however it does blow your Out of America belief out of the water. "Amerindian lineage collection is made of very upstream and very downstream clades". What 'very upstream clades' are you suggesting? As far as I can see they are confined to very downstream clades. If I interpret that tree correctly, R1b is from central Asia: the oldest paragroup is light blue for central Asia. 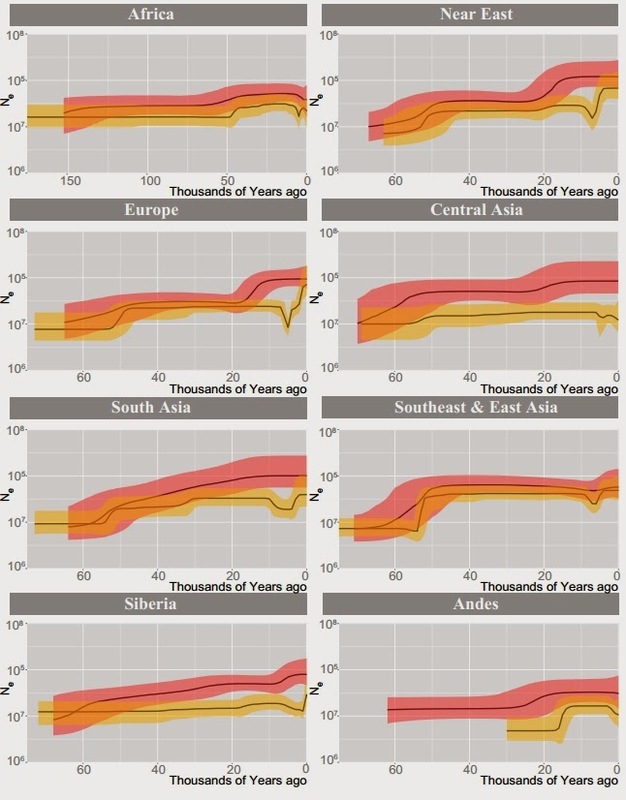 You really don't need "patriarchs" to explain the memory of the 10kya dip. Who would even remember it? There were all kinds of events since then that would have created the Last Man Standing in many local environments. Although it's possible that a natural disaster was involved, this may again be evidence that the change from foraging to food production was transmitted by females. Conservative males who stuck with hunting-gathering were left out of the reproductive process -- they simply weren't around because they were out hunting-gathering. The circle of the family moved to women at the center versus males as itinerant food suppliers. Males who adopted the new technology and economy were simply more attached to the women and more likely to father kids. The dip also shows a sharp spike upward so this situation did not last too long. No surprise...as Jared Diamond details, agriculture creates warfare. Looking at the YDNA map, there is no way that our male lineage could have gotten paired up with their current mtdna mates unless man slaughtered all the men in the tribes they invaded over and over agin in our prehistory. Otherwise descendents of DE would still be in the middle east and central asia and would still have more of a presence in China and Y hap C would still be in europe. If hap R were not a violent man slaughtering race, for instance, it would not have so many more mutations as compared with P. And there are many more examples of that all through our history. I highly suspect that whatever male counterpart took mtdna M into asia, it was not one which has any descendents today. today. It was most likely a "not-so-ghost" population called Mungo man. Like lions, we killed the men and boys when we took over a territory...and agriculture multiplied that exponentially. Of course there's a bottleneck at that time. Oppenheimer has already shown that there were three flood periods at the end of the last LGM and Jared Diamond has already shown that anytime that you inform a primitive agricultural society about a peaceful society, the peaceful society gets invaded and all of the men are murdered and replaced. The agricultural revolution was accompanied by the spread of headbinding, circumcision, headhunting, secondary burials, and disapearing male lineages. So, in a few words, it is mathematically impossible for anyone to make a valid assumption on anything relating humans that dates beyond 10 000 years. Once you've established this date as a bottleneck, then you can't sell any older dates. C14 dating won't work, (that's a FACT) and DNA working samples from human fossils are inexistent. So where do all this assumptions of 50 000 to 2M to 4M years come from? An attempt to avoid ridicule?